As a Non-Resident Odia (NRO), I am often asked if rasgulla, the sweet dish, is of Odia or Bengali origin. If I say the sweet dish has Odia roots, will that make me more ‘scientific’ or ‘chauvinistic’? As I look at those expectant eyes and feel the bated breath, I realize I will be judged no matter what I say. All I can present is my truth. So, what do we know? Here are some of the facts (all vociferously disputed). Sweets made of split milk (chenna) are popularly known as Bengali sweets, distinguishing them from the sweets made in the rest of India using non-split milk products such as curds, ghee or boiled down milk (khoa). Milk is sacred to Hindus, and so the practice of splitting milk is not considered sacred and is certainly not ceremonial, and not part of the mainstream Hindu discourse. 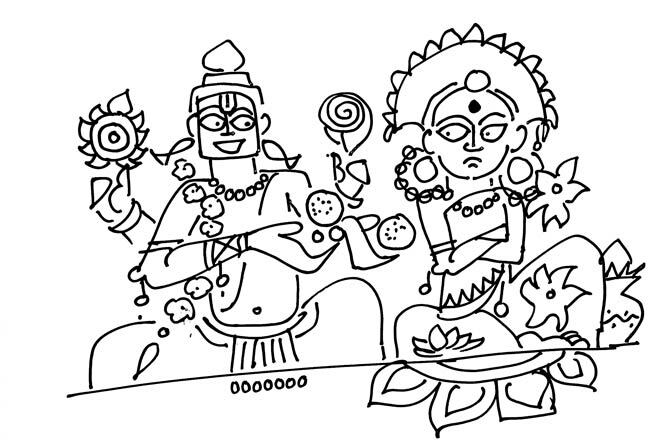 Krishna is fed milk, butter, ghee and curds, never cheese. Even if cheese was known to ancient India, it was clearly not popular. Historians have traced the use of paneer (Urdu for cheese) to Turkish and Central Asian warlords who entered India from 10th century onwards, or probably even earlier to Indo-Greeks who controlled North West India a thousand years earlier. Originally, paneer was made by carrying milk in bags made out of the stomachs of herbivores — camel, sheep, calves etc. The Portuguese who traded with India from the 16th century onwards probably introduced the use of lemon and other vegetable products to make ‘chenna’. What is mysterious is that though the Portuguese traded with the eastern, western and southern ports of India, only the east chose to turn split-milk into sweets. Here, east is not just Bengal (West, or East), but also Odisha, all with long coastlines and maritime history. Nationalists who believe ‘all things came from India’ usually disagree with this foreign hypothesis. In the Jagannath Puri temple, rasgulla is part of ritual. It is offered by the deity, Jagannath, to his consort, Lakshmi, when he returns home from the chariot festival ride, to appease her for the slight of leaving her behind in the temple. While it is not a standard dish listed in the standard list of 56 bhogs for the deity, this ceremonial inclusion within temple rites makes it special and indicates both familiarity and acceptance, which takes a long time in temples. Please note: even today, in Odia temples potato is not offered, as potato is foreign. Thus, to be part of ritual, a long period of familiarity, until foreign memory wanes, is desired. Did it happen in the 13th century as is claimed? Probably not. But clearly a very long time of familiarity (over 300 years?) making it an Odia dish, at least for the Odias. It still remains exotic: an offering associated with the ‘outside’ street excursion and not from the ‘inside’ temple kitchen. The dish probably originated in the nearby village of Pahala, inspired by the ‘sweet round eyes’ of Jagannath. Who made the dish famous across India? The credit goes to a Kolkata-based confectioner Nabin Chandra Das who created the dish in the 19th century. Did he invent it himself? Did he modify the invention of Odia cooks who were popularly employed in Bengali households during this time? We will never really know. Just as India’s small neighbours do not like the overbearing nature of the Indian nation state, the eastern part of India has a problematic relationship with Bengal, for it towers over and overshadows everyone else, appropriating all things, including the birth place of Jayadeva who composed Gita Govinda in Puri. This can be both irritating and exasperating. But in the democracy offered by the Internet, these long ignored frustrations express themselves safely in virtual battles, as in case of the rasgulla. To me, just as Krishna has two mothers, Devaki and Yashoda, so does the rasgulla (however you wish to pronounce it). Only, our animal instinct to be territorial just does not allow it.